Have you ever heard about Champion?. If you have some sport impression about the Champions, you will get a little bit wrong guessing here I am afraid. 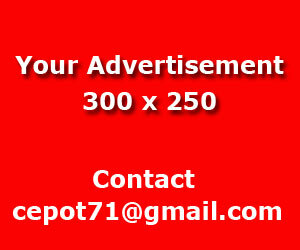 The word of "champion" in my posting today is a term of a volunteer work. The Champion is a call sign name from Kang GURU Indonesia to mention Indonesian citizens who have donated efforts, suggestions, ideas, and valuable contributions to foster the friendship between Indonesia and Australia. The champions are working very hard in fostering a close relationship and mutual understanding between the Governments of Indonesia and Australia in Indonesia-Australia Partnership (Australia Indonesia Partnership). In carrying out the activities, all of the champions all across Indonesia do not get paid at all. 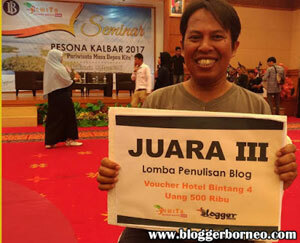 The Champion here is a volunteer who "worked" in accordance with directives and guidelines of KangGURU Indonesia. Each of those representatives of Kang GURU Indonesia all across Indonesia, should provides monthly reports to headquater of Kang GURU Indonesia located in Denpasar, Bali. As have planned before by the Kang Guru Indonesia, we get together, and attend annual Consultative Group Meeting (CGM) in IALF Denpasar , Bali. The CGM held annualy at Indonesia Australia Languagre Building Foundation (I / A / / L / F) building located in Jalan Sesetan Denpasar Bali, and the meeting administered by Kang Guru Indonesia, and funded by Australian Government and administered by I/A/L/F Denpasar Bali. The meeting can be held twice a year, and most of the meeting conducted at the headquater. We represent nobody ever since. Who Are We?Kang Guru Indonesia has seven wonderful Champions. They are 7 (seven) Champions appointed by the Kang Guru Indonesia to engage as "volunteer worker" based in all areas of Indonesia. They are Saptari Wibowo (Medan), Suryadi Ningrat (Madura), Keyko Sri Rahayu (Semarang), Rini Pudya (Jakarta), Fadil (Mataram), Syahrir Badulu (Makasar) and myself Asep Haryono (Pontianak). My name's Saptari Wibowo. I am the head of Medan English Speaking-Club (MES-C) KGCC #50. Our club has been linked with Kang Guru for more than six years, starting from 2001. 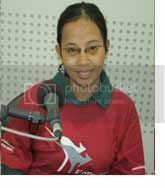 I am also active as the English interactive presenter on RRI Medan (PRO 1) 94.3 FM broadcasting AFTERNOON CHAT on wednedays, at 16.20 till 17.00. Afternoon Chat broadcasts on Wednesdays after Kang Guru shows. I and Rani (official announcer of RRI) work hand in hand to help people in my area confident to use English, especially when I am on air with her. This interactive shows has been on air for almost nine months, starting in January. There have also lots of activities I have done with our club members, especially students. Though we sometimes encounter some technical matters, but we still run our activities in Medan. I am proud of being one of the Kang Guru's Champions cause it's one of the most unforgettable achievements presented by Kang Guru. I could hardly believe how it could be. Kang Guru has been one of the most responsive organization helping people be confident and active with their English. His hobbies include watching news on Metro TV, surfing the Net, especially Kang Guru, and organizing the events in Medan. Fadel has been promoting and helping KGRE for several years in his hometown of Mataram. 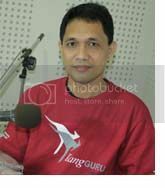 Fadel is the interactive radio presenter on RRI Mataram's Friday and Sunday night programs. Fadel is the leader of the successful KGCC #013 ALFA English Club in Mataram. Fadel has been very helpful in recent years with organizing Listener Meetings at RRI Mataram, visiting local schools to promote Kang Guru and also assisting with visits to Lombok by Australian Education Center staff from both Jakarta and Surabaya and more recently by staff from the Australian Consulate in Bali. There are many wonderful people in Indonesia who help Kang Guru. The Kang Guru Champions are just some of them. Their valued assistance involves promotion of Kang Guru and the work of the Australian Indonesia Partnership (AIP). This is very important as Kang Guru depends on this kind of support of spreading the word about radio programs, magazines and the website. It is a great way to help others who are interested in English. Other helpers lend assistance with teacher workshops, language clubs and Kang Guru's latest service providing assistance to a new band of interactive radio presenters. Ririn lives and works in Kediri, East Java. Why is Ririn a Kang Guru Champion? Ririn joined Kang Guru when she was a keen and popular interactive radio presenter on Radio Bonansa in Kediri. Now she is based in Jakarta but still does alot of work for KGI promoting Kang Guru to teachers and students in that city. Ririn has plenty of good ideas too to help local students and her radio listeners, and is a great supporter of Kang Guru. Ririn spends much of her time travelling around Indonesia for her career as a singer but Ririn still has time for KGI. Suryadi is a very, very dedicated young teacher from PP Al-Amien in Prenduan, Madura. He is also a keen Kang Guru supporter. 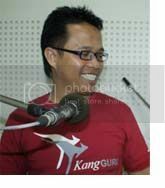 In mid 2006 he and his team organized a very interesting KGI Teacher Workshop and KGCC Get Together in Pemakasan, Madura. Suryadi has since run several further teacher activities and several language club activities too on his home island of Madura. Great to have Suryadi as a part of the team. Keep up the good work as a volunteer for Kang Guru. Suryadi is a shining example of friends helping friends, teachers helping teachers and champions helping everyone! 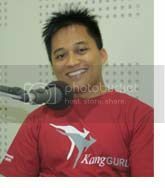 Syahrir has been associated with Kang Guru for over 5 years. 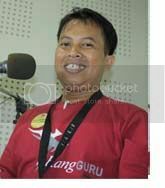 He has presented Kang Guru on RRI Makassar for a long time. He has been leading The Best Forum Club, KGCC #003, for the past 7 years as well. They are definitely one of Kang Guru's MOST active and interesting language clubs. In that time he and his helpers from other Kang Guru Connection Clubs based in Makassar have organized 2 wonderful Club Get Togethers – fantastic!!! Syahrir works hard with local English teachers in Makassar and is always happy and keen to promote and support he work of Kang Guru. Welcome to Kang Guru and for being one of our Kang Guru Champions in Indonesia. Keyko has been a keen supporter of Kang Guru for many years. To begin with Keyko was the leader of the very active English Society Club, KGCC #010 based at RRI Semarang. Her more recent activites have included working side by side with KGCC #032, the Student English Activity UMY (SEA-UMY) helping victims of the earthquake in Yogyakarta in 2006. Keyko is always full of ideas and spends a lot of her time promoting Kang Guru in her area. Kang Guru is very please to have Keyko as one of our Champions and looks forward to her future ideas and activities. works in Kalimantan at the Pontianak Post newspaper. He is the IT person in his office and is pretty good at what he does. 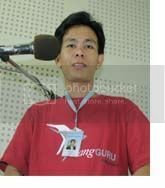 Asep has been supporting Kang Guru over a period of many years with ideas and suggestions mainly for the Kang Guru website. There's even a link from the website of his newspaper direct to Kang Guru. Perhaps there were some big questions about us. Who are we?. What are we supposed to do in Indonesia?. Why only Seven people so far?. Well, those questions need to be answered. Who are we?. Yes, We are the Seven young people who contributed and assisted KangGuru Indonesia to spread its program and promoting KangGURU programs across Indonesia. 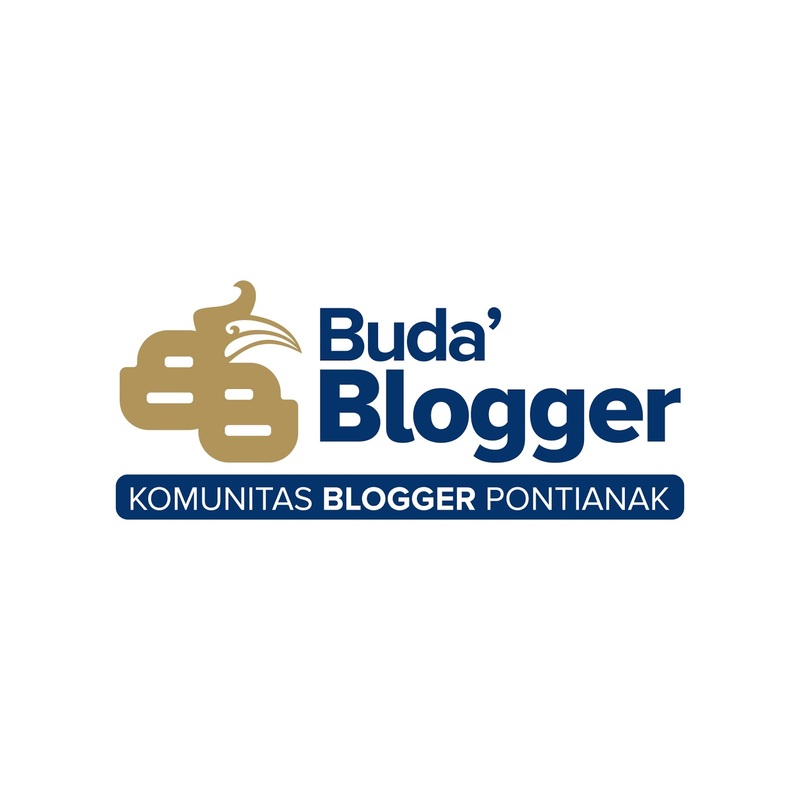 We have been selected from thousands of people in Indonesia whose actively contributions for KangGuru Indonesia through KangGuru Indonesia magazine which published all across Indonesia four times a year ; March, June, September and December. I have seven years experiences in the KangGURU Magazine before I was awarded as official KangGURU Representatives in March, 2007. Most of those Seven KGI Representatives are working in a various of positions such English Interactive radio presenters, English Teachers and also private sectors employees. What are we supposed to do in Indonesia?. We have many work to be done in our area such as promoting KangGuru programs at schools, English Clubs, and also helping and assisting KangGURU Radio programs at RRI in our provinces with suggestions, and ideas. We are also asked to find new Local radios to join KangGURU together to broadcast KangGURU Programs once a week. KangGURU radio programs here Pontianak can be heard at RRI Pro 2 FM (101,8 Mhz) On Sunday afternoon at 16.00 WIB once a week and RRI Sintang (96,6 Mhz) every Saturday at 16.30 WIB once a week too. 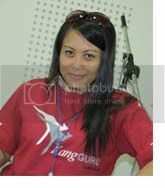 However most of the KangGURU Representatives were supported by KangGURU for their operational tools and other supported materials, they are volunteer workers originally. Yes, we are indeed volunteer workers. KangGURU never pays us with money, and this is absoluley not part of their normal work. Why only Seven KGI Representatives so far?. There are many wonderful people in Indonesia who help Kang Guru. The Kang Guru Champions are just some of them. Their valued assistance involves promotion of Kang Guru and the work of the Australian Indonesia Partnership (AIP). This is very important as Kang Guru depends on this kind of support of spreading the word about radio programs, magazines and the website. It is a great way to help others who are interested in English. Other helpers lend assistance with teacher workshops, language clubs and Kang Guru's latest service providing assistance to a new band of interactive radio presenters. The answer is yes for this time. 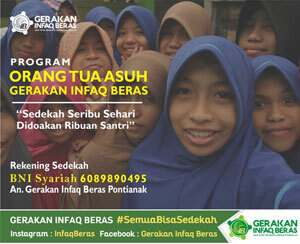 KangGURU Indonesia doesn't have primary target to increase their official volunteer workers to assist them in this way. Each of us ,those Seven KGI Representatives , make a monthly report to KangGuru Indonesia in a regular basis. The reports of each KGI representatives in their areas, and the reports might usually be accompanied with photos taken or just simple reports with standard format that has been approved by KangGuru. Unlike Stringer from the Voice of America (VoA), this KGI representatives is not a job, and we donot get any paid at all from the KangGURU Indonesia. As I told you before that most of the work to be done are free of charges and we are really volunteer workers. We hope that people will understand our position and be pleased to work together with us by providing some information we need. The 7 KGI Champions visited Bali in late December to help pack up and also to say goodbye to KGI. There was a bit of a party for the whole KGI team with an Aussie-styled sausage sizzle combined with nasi tumpang/nasi kuning. Kang Guru Indonesia's seven wonderful Champions are from Medan, Semarang, Madura, Kediri, Makassar, Pontianak and Mataram. They are so talented and hard-working volunteers for KGI. Woow, what a great champion ones! KGI must be so proud of you all..
Sue, Ayu, and Kevin are the names and the voices I will always remember, for in my research I must replay the record of the program to analyze some linguistic things and put them in my thesis.. Sooo happy to do that..